If you've ever perused the noodle aisle at an Asian supermarket, you know the variety can be dizzying for home cooks who aren't familiar with the many types. And it's one thing to follow a recipe—simply buy and use whatever noodle the recipe calls for. But what if you're looking to experiment and branch out a little? In that case, you'll want to know a little more about what each type of noodle is all about. In many cases, each type of noodle can be served in various ways, like in broth, stir fried, deep fried, as well as either cold or hot. Wheat is the most popular grain used for making noodles around the world, and this is true of Asian noodles as well. Asian wheat noodles are generally made with wheat flour and egg, just like Italian pasta. One key difference, however, is that—while Italian pasta is made by rolling and then slicing the dough—many forms of Asian egg noodles are made by pulling and stretching the noodles. This works the glutens in the dough, just as rolling does, but the resulting noodles differ in their texture and consistency. In general, Asian noodles are springier and bouncier than their Italian counterparts. The two most common types of Chinese wheat noodles are lo mein and chow mein. Both are made from wheat flour and egg, and they're cylindrically shaped, like spaghetti, but a bit thicker, closer to 1/4 of an inch. Both lo mein and chow mein are available in fresh and dried forms, especially if you're fortunate enough to live near a large Asian grocery store. If not, you might be limited to the dried kind. Both the fresh and dried varieties need to be parboiled briefly (follow the package instructions; cooking time for dried noodles will be a bit longer, and also depends on thickness), which allows them to puff up slightly and achieve their desired "bite" (the equivalent of al dente in Italian cooking). After parboiling, the noodles are cooked with stir-fried meat and vegetables, along with a sauce, or alternately, the noodles themselves can be stir-fried for additional crispiness. Chow mein noodles are usually crispier, while lo mein noodles are soft. Therefore, given a choice, fresh noodles work better for making lo mein. Plus, it's often possible to substitute Italian spaghetti, vermicelli, or angel hair for Asian egg noodles. Here's more about the difference between lo mein and chow mein. Another massively popular variety of egg noodle hails from Japan in the form of the ramen noodle. Ramen noodles are treated with an alkaline ingredient called kansui, which causes them to take on a curly shape. Thinner than either chow mein or lo mein, ramen is traditionally served in a broth flavored with salt, soy sauce, miso, or pork, along with various kinds of vegetables, meat, and other toppings. The instant variety of ramen unquestionably has its appeal, as evidenced by its ubiquity on grocery shelves from North America to Asia. Authentic ramen restaurants, however, will serve a fresh variety, which are also available at larger Asian groceries. Because they're relatively thin, ramen noodles will soften as they linger in the broth, so it's important not to overcook them initially. Udon noodles are another Japanese favorite, but unlike ramen, udon are fat and chewy, offering a distinct bounce as they dangle from your chopsticks and a toothsome consistency in your mouth. Also generally paired with broth, udon noodles are most often sold fresh, but dried and even frozen ones are available, although the fresh variety boast a superior texture. Soba noodles are a unique product for a couple of reasons. One, they're made with buckwheat flour in addition to wheat flour, which gives them a distinctive flavor, texture, and light to dark brown color. And two, rather than being served hot, soba noodles are usually served cold, alongside a flavorful dipping sauce. Cold soba noodles, sometimes actually chilled with ice before serving, are a refreshing summertime dish in Japan. Note: Somen noodles are similar to soba except that they're fully made from wheat rather than buckwheat, so they're white instead of brown and have a smoother texture. They're also typically served cold. Rice noodles make up the second broad category of Asian noodles. Made from rice starch, rice noodles are available in all kinds of lengths and widths, and can be found in the cuisines of nearly every Asian and Southeast Asian country. They boast a firm, springy texture—to a greater degree with wider, thicker varieties—and they're able to absorb the flavors of the sauces or broths that they're served with. While fresh rice noodles are available in the bigger Asian groceries, the number of varieties of dried rice noodles far outnumber the fresh kind. Rice noodles are featured in soups and stir fries, and dried rice noodles will often need to be soaked or parboiled before cooking. Most rice noodles are flat and while there is great variation in noodle width—with some of the wider ones being around a centimeter wide—most measure around 1/4-inch, or about the same width as linguine. Pad Thai, for instance, is a classic Thai stir-fried noodle dish made with 1/4-inch rice noodles. 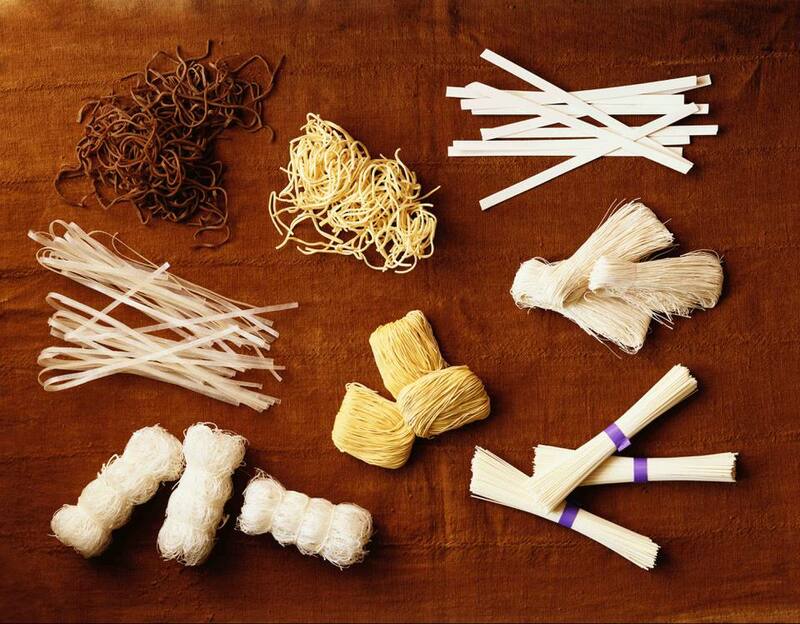 Thinner, finer varieties of rice noodles are sometimes called rice sticks or even rice thread. Vietnamese pho is another popular noodle soup that's made with rice stick or rice thread. Note that while not technically a noodle, the same ingredient that goes into making rice noodles can also be formed into sheets, called rice paper, which is what those Vietnamese or Thai spring or summer rolls are wrapped in. Finally, glass noodles—sometimes also called cellophane noodles—are a broad category of noodles made from any other sort of starch other than wheat or rice. Mung bean noodles are quite common, as are noodles made from tapioca starch and sweet potato starch. Despite their diverse origins, the process for making these noodles involves isolating the starches from these various sources, so that the noodles themselves do not taste of anything in particular. These noodles are usually much thinner, almost threadlike, and are called glass or cellophane noodles because after they're boiled they take on a glassy, nearly transparent appearance. Their texture is generally very springy, and they are often served in stir fries. Deep-frying these noodles makes them particularly crispy. Like rice noodles, glass noodles also need to be soaked before cooking, except if you're going to deep-fry them. Once they're soaked, glass noodles require a relatively short cooking time, from 3 to 6 minutes depending on the quantity. After draining and rinsing thoroughly with cold water, toss with oil to prevent them from sticking. And remember, glass noodles absorb the flavors of their cooking liquid, so if you're not cooking them in broth or stock, make sure to at least salt the cooking water.